I encourage everyone to post photos in CF because everyone enjoys seeing photos of boats and photos of gear helps to clarify communications about problems and helps others help one another with answers that fit questions. When you post a comment, you can use the "Post Reply / Advanced / Manage Attachments" function to add up to 12 photos to your post. It first allows 6 photos, but if you upload six first, you can then add another 6 for a total of 12, if you want, all embedded in a single post, and all uploaded at one editing time. Be careful not to take too long to upload and edit your posts, as the forum software "times out" after a few minutes (and no one knows how long that is, but I suspect about 5-10 minutes), and all that writing effort can be lost. This is a common problem for members who write detailed or long posts. If your post will be long or complex, or involve original writing, it is a smart idea to write your post on a text document using an off-forum text editor, then when you are finished writing it, copy and paste that Long text block into a new post. This is safer. I know, because I have lost original writing efforts due to the forum software timing out on me, causing a total loss of effort. This has happened to other CF Members too. So, if your post is long, or detailed, or complex, or important original writing, then make sure you write it off the forum first. That is what I do, after learning the hard way. You can find a very easy to follow video instruction about how to post photos on CF by going to the FAQ here or look on YouTube for a very clear video that shows how to do it. It is easy, but not intuitive. The video is a big help. Here is a link to the video. Watch and it is very easy to do. You can also post other types of content (videos, etc.) and photo files of many kinds. I usually post a jpg photo file that is about 1200x800 pixels, because that is what I consider a nice large size for web viewing. Most files can be downsized to about 100kb - 400kb or some larger. If my original photo file is high resolution (like a photo I take with my iPad), I prefer to first use some software (an app) to downsize the image file so that it is smaller and faster to upload. Since I use my iPad for most of my web surfing and CF surfing too, I use a free app called "Image Size" (by www.vsmedia.de) which is very easy, fast, and has multiple options. It does have some ads in the free version, but $1.99 removes the ads. I have no connection to that app other than being a happy user. It works for me and is intuitive and flexible. If you think you might refer to that photo in the future (e.g. Photos of your own boat or boat projects or gear), you could also upload it to your CF Profile and start a photo album there to contain your boat photos. Some people will upload photos to their own blog or website or a photo hosting site, and then use that photo or want to embed that photo in a post. Since I do most of my surfing from my iPad, I simply copy a photo and save it to my iPad, then upload it to my posts from my iPad, or Mac if I am using it instead. In other words, I temporarily have the photo on my iPad, and then after I upload it in my post I delete it from my iPad. Type and model and size of boat. 150w on the arch, 30w in front of the sprayhood and portable suitcase 60w panel that roams around the deck facing the sun. Age of Panels: When did you install the panels? All panels are less than 2 years old. The 150w on the arch should be free of most shading, the 30w in front of the sprayhood is affected by the mast and boom. The portable 60w is moved every few hours to point directly at the sun. 150w in Solar world, 30w is a Lensun semi flexible 30w, suitcase not known. Total Cost: 150w panel £219, second hand arch plus connections £300, 30w £100, suitcase £60 (secondhand) Victon 75/15 MPPT £85, total £764 ($955). Total Efficiency: Panel efficiency not known but not critical, price was more important. The 150w panel is connected to the a frame with u bolts and lashings enabling the panel to angle 20 degrees towards the bow and up to 90 degrees to the stern. Previous Solara semi flexible panel failed 2 years ago after about 10 years when the top plastic layer turned a white opaque colour. Replaced by the Lensun. A previous 80w rigid panel mounted on the pushpit was hit twice by other yachts in 3 years, second time bending the frame, surprisingly despite a really good bashing the panel still worked. Go for a bigger system from the outset rather than start with smaller panels and working up. However, the price of solar has fallen over the last 7 years making larger panels and MPPT controllers far more affordable. Any problems? Disappointments? Surprises? Dissatisfaction? Issues? Weaknesses of gear or system? Dealing with a mix of 25mm tube and fittings connecting to 1" tube and fittings required a certain amount of bench fitting and persuading. 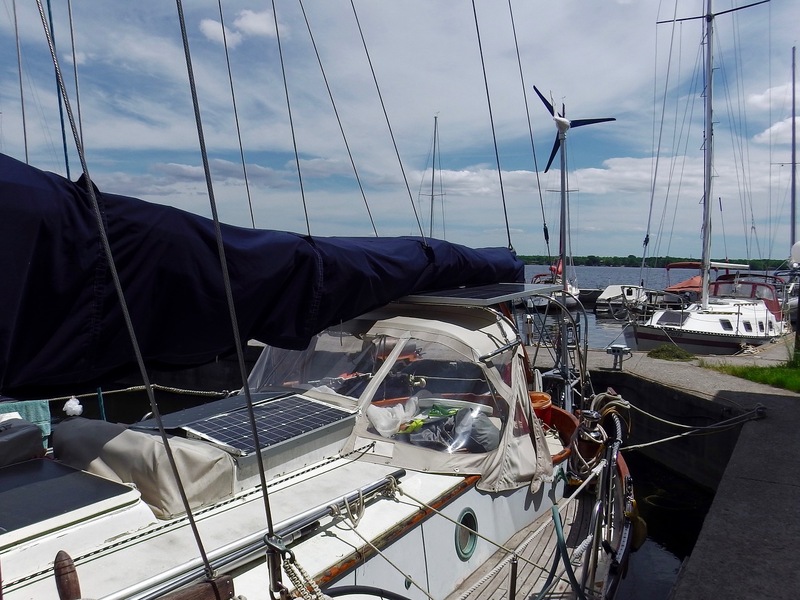 How has adding the solar affected your sailing or cruising? Increasing the solar 3 years ago has meant we have sold the Honda genny and now run the engine far less. In addition since we rarely use shore power the anodes now last 2 years rather than 1 year. We now actively seek out cheaper anchoring spots in quiet locations rather than head for a marina. A sim card mifi keeps us connected whilst away from the herd. Some photos probably in chronological order. 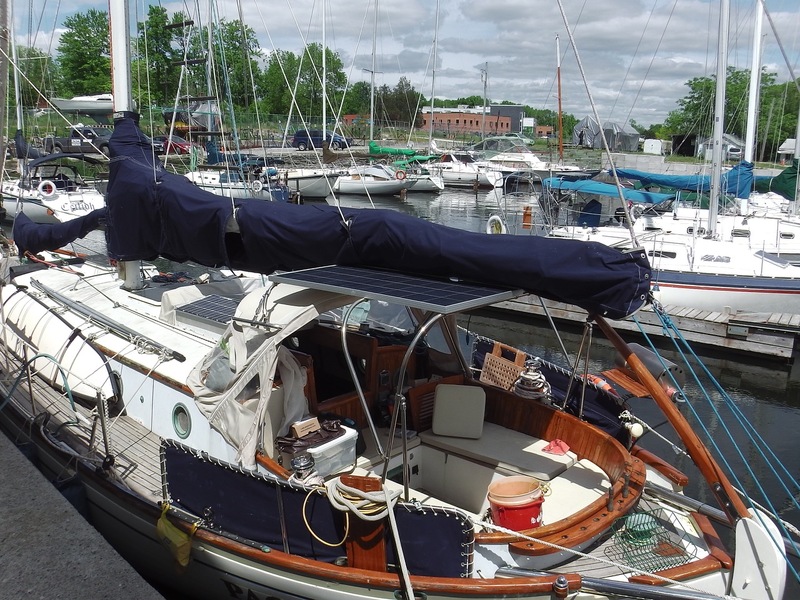 Saw this today in a sale listing (not my boat). Here is our schematic for our solar and estimated budget. We didn't end up adding new batteries. Our 600 amph were enough. We also change to the Victron Colour Controller. 1) Are your panels wired in series/parallel? 2) Did you install bypass diodes between the panels? Planning the install of panels on my boat now, hence the questions. Good post! Thanks for following the suggested format of Q&A. The photos are helpful too. Thanks for adding to this mix of installations. [QUOTE=epiic;2319784]Type and model and size of boat. 5 x 140w panels = 700w / Generally get 3,000wh on a sunny day in Florida. Panels are attached to 1-1/4" bimini frame with Gemini hinge brackets. No problems so far. It added rigidity to my bimini frame. Its mounted very close to the canvas so wind is not an issue. I've only been in 35 knots so far. Rigging is not a factor. Each panel cost $1,399 + $149 for ez mount frame. That's 1548ea ($7,740 total). With the cost of taxes, shippiong, 1" tubing, mounting brackets and Victron Energy MPPT 150/60-TR controller, it was roughly $10k. I also purchased 7 Firefly Oasis Group 31 AGM carbon foam batteries (770ah). Each battery cost $486 for a total of $3400. I am lost for words..............did you REALLY spend $1548/panel??? WHY??? And to the Victron, I ordered a 150/70 T, delivered today for about $650 with a remote panel and USB adapter. We have 400 watts of solar (plus a 400 watt wind gen). Two 50 watt semi-flex panels from Aurinc in front of the dodger on hinges, and two 150 watt standard panels from EcoSolPlanète as a bimini over the cockpit. No hinges. All run in parallel to single charge controller. Am upgrading controller this season to Victron MPPT. Prior control was same one used for wind gen.
Two semi-flex bought about four years ago for a lot of $$$ (forget how much). Great panels. Tough, high efficiency. Probably cheaper now. Two standard panels from this Quebec company two years ago (installed last season). High efficiency, relatively inexpensive. Am pleased with the solar install. Get lots of amps, even without angling to sun. Am not happy with my existing charge controller, which I’ve learned is the worst possible controller for solar. Am hopeful the new MPPT will provide better charging control. We stay off the dock for extended periods. Solar is the primary battery charger. Even with the crappy controller (and inefficient fridge) we were able to keep batteries up, although it did require turning off fridge at times. Am pleased with the install (designed and done by yours truly). That's a neat install. Thanks for sharing! I'm installing an array on my boat now, pretty similar to yours: 4 identical 100W pannels on the coachroof, wired in parallel, and connected to #2 MPTT controllers (one would be sufficient, but I want to have redundancy). Question: did you install blocking diodes between the panels? Logic (or rather gut feeling) suggests they are not required between panels on an array connected in parallel. I'm thinking in terms of minimising the effect of partial shading. The controller itself will prevent reverse current flow from the battery towards the panels at night. Fully autonomous on electricity ! I am very glad to see more solar installation examples (photos) posted. It is very interesting to see the panels actually installed on a variety of boats. I also encourage everyone to COPY the fact finding questions shown in the OP (original post), then paste those into your post, then fill in with your answers to those questions. That helps keep it easy for everyone and that kind of info can help others too, even if some answers brief such as "yes, no, NA, not much, etc.". WOW! That is a big panel install on that size boat. If you ever get a masthead (overhead) view, that would be interesting to see in this thread too. Panel Size: How big are the panels? Individual? Total area required? Panel Location: Where is the panel located and does it cause problems there? Does it cause problems with any other gear or while sailing? Does it cause windage problems? Has shading of the panels been a problem due to location of the panels and surrounding rigging or equipment? No windage, no problem when sailing. No shade. Type and Brand of Panel: Who made the panel? What type of panel is it? Marine or Domestic (land) panel? Origin? Total Cost: How much did it cost to build the system? How much was each panel? Total Efficiency: Do you consider the installation efficient? Please any comments that may help another improve efficiency, based on your experience. Didn’t check efficiency yet, batteries are always full so I got plenty of power for the current power consumption. Damage? Has the installation been damaged by wind or corrosion or breakage? What would you do differently next time? Tips? Different type of panel? Any problems? Disappointments? Surprises? Disatisfaction? Issues? Weaknesses of gear or system? I design the rack myself and it lack some strength at first. Then added some brace and it’s all good now. How has adding the solar affected your sailing or cruising? It added weight but that’s it. Today I had a thought about Solar on Boats (this thread topic). What follows is written in a friendly tone, and to further this discussion of Solar Installations on Boats. This is not a competition, but simply a question that could yield some interesting photos and some interest for CF readers. Of course this is also intended to be for some fun too. "Who on CF has the LARGEST Solar Installation?" Now, that could be a large number of panels or Most Panels. Or a few LARGE powerful panels. Or the LARGEST number for energy production (you know, those numbers). Anyone here want to post a "WOW" number to give us a sense of how much solar is going on a boat. Anyone here want the "bragging rights?" We know the power catamarans will have an advantage. IF you want to enter your boat in this little friendly competition, please state the configuration of your Solar Installation (see the OP or top or first post for example of questions) AND include a photo as proof AND clearly state which of the 3 categories above you wish to be considered. Anyway, I am just curious what you have seen as far as the "LARGEST" (biggest) type of Solar Installation on Boats owned by CF Members. For the purpose of this question, I don't mean the circumnavigating Planet Solar (though I am going to post a few photos of it to illustrate this thread), and because it is a WOW boat. What puzzles me is not who has the largest panel array but why are so many paying so much for panels. For sure...... Solar is the way to go at least for boats. Lost track of time, it could have been as long as 4-5 years ago when I first installed 4 poly panels with advertised rating 140-150 watt/panel (18Vpp) along with a ProStar 30 PWM controller. I do remember however that the cost of the panels back then was only $160 each delivered but sold in pairs at Amazon. Those panels are still on my boat until my new Canadian 295 monos are delivered, that could be September; back ordered. OK, the wiring I did is parallel and there is at least a 2 volt drop (about 60 watts) when they provide 32 amperes to my batteries. NOPE, not with the ProStar 30 but with a Victron 150/70 newly purchased controller. Best I did with ProStar was a meager 24 and only once. This coming week end I intend to change the wiring to series. More later on that. But back to $$$! The Canadian panel reviews indicate these panels are functionally fine. More than that.... who knows and just maybe the "who knows" could be the reason so many are spending so much. My four ordered 295 watt panels with a theoretical 1180 watts maximum will cost when they finally get delivered $183 each plus freight or a total of only $732 big ones. Heck, the controller was only about $620 with remote metering and the necessary cable plus a USB adapter. Back to what confuses me....why are people spending so many bucks for their systems?